An artist’s last try to avoid death and keep on creating. What is the birthing process? What is the price a woman has to pay to create something so original and ground- breaking? a Toneelgroep Amsterdam production, after the novel by Ayn Rand. as part of the TGA program "Perform in the set of The Fountainhead". The box office is now open. Liesbeth Rood, Gerben Tuin, Caroline Bech, Amelie Onzon, Simona Beltrami, Tiziana Benguerbi, Cristina Bolis, Matthew Carney, Bryone Cole, Samhita DasGupta-Doblie, Brian Pagan, Alyssa Wagner. The play is set in The Bronx borough of New York City, New York, in 1933; and it is concerns the impoverished Berger family, who all live under one roof, and their conflicts as the parents scheme to manipulate their children's relationships to their own ends, while their children strive for their own dreams. The audience is introduced to a unique family. The matriarch of the family, Bessie, had high hopes and dreams for her family; however, despite her hopefulness, her largest fear is that her family will lose their home and all their possessions. This fear stems from a woman down the street who had this exact thing happen to her. The household consists of extended family such as Bessie's father, Jacob, her husband Myron, and their son Ralph, 21, and spinster daughter Hennie, 26. To top it all off, in order to ease the financial burden on the family, the Bergers have taken in an immigrant boarder, named Sam. Besides the desire for financial stability, there are other problems that the Bergers face, such as Hennie's unwanted pregnancy. To avoid this burden on the family, Bessie insists on the marriage between Hennie and the new immigrant boarder in order to save her family's reputation and her daughter's life. Hennie has no love for Sam. The family has very different views on the arranged marriage between Hennie and Sam. For example, Ralph, a more philosophical character of the play, is not in agreement with his mother's decision. Ralph very much resembles his grandfather who is an idealist. The Berger house is therefore divided into idealists and realists, much like society as a whole. In a turn of events, Jacob commits suicide after making Ralph the beneficiary of his life insurance policy, in hopes that this will give Ralph the freedom for which he yearns. Clifford Odets (July 18, 1906 – August 14, 1963) was an American playwright, screenwriter, and director. Odets was widely seen as successor to Nobel Prize-winning playwright Eugene O'Neill as O'Neill began to retire from Broadway's commercial pressures and increasing critical backlash in the mid-1930s. From early 1935 on, Odets' socially relevant dramas proved extremely influential, particularly for the remainder of the Great Depression. Odets' works inspired the next several generations of playwrights, including Arthur Miller, Paddy Chayefsky, Neil Simon, David Mamet, and Jon Robin Baitz. 1. Prepare a two minute monologue. 4. Send an email to tv@theodoravoutsa.com with the link to your audition tape, a password if necessary and your details. Do not send us the video file, it will not be accepted. 5. You can send your link anytime between now and October 20th, 2017. Once we see all the audition tapes we will notify you for a call back. First read through will take place early November. Opening is planned for early March. Looking forward to seeing you in action! Actors participate in a series of targeted exercises that develop effective methods for on camera work. Material covered will include close-up vs. wide shot techniques, playing an inner monologue and playing objectives. Self- tape auditions. At the end of class, actors will be assigned scenes to prepare for mock castings the next day. As an auditor you can watch the Masterclass but you can not participate in the exercises. Fill out the form below so we can send you information on registration. We respect your privacy. Your data is safe with us. Are you hungry, passionate and coachable? Do you want to lead a team? Do you want to lead the professional and personal life you want and deserve? Creative Leadership and Emotional Intelligence Workshop for your personal and professional empowerment. Creativity is no longer elusive and intangible to pin down. With The Los Angeles Method programs you can identify and develop your creative skills. Learn how to use your emotions (emotions being the fuel we use to achieve our goals) instead of your emotinos using you. Use these emotions to connect and empathise with your team. Use your vulnerability to be creative, action oriented and a problem solver. According to Carol Dweck, professor of psychology in Stanford, Yale and Harvard, people are in either a "fixed" mindset or in a "growth" mindset. In which category do you belong? Do you believe that you can grow, change, become the creator of your reality? Do you want to create the circumstances you are experiencing or just react to them? Do you want to connect with the world and have them hear your message? Do you want to raise your self confidence and live the life you want and deserve? Do you want to have more authority in what you do? Do you want to be a #Boss? Do you want to command attention? Do you want to create the Role you want to Be? No refunds after January 23rd, 2017. The spaces are limited. 8 seats only. In the TEDx ‘style’, invited guest speakers will share facts and personal stories that will enlighten us on matters of leadership, empowerment, equality, human rights and humanism. The following guest speakers will share their stories and their inspiration. One word that captures the essence of all these speakers is 'Dare'. These are definitely 'Women on the Move'! If you scroll to the bottom of this page, you will find a number of bio's for the guest speakers. For information about the other speakers, you can click on their name for their LinkedIn profile. Starting May 17th, 2016 for 4 weeks, every Tuesday at 7pm to 9pm. In this Cycle you will learn how to Create a Role. We will cover the theory, the base of acting, and then we will put the theory into practice using Chekhovian scenes. You will become part of our community at The Los Angeles Method. Every week we will work together on your technique in class. During the week you will get the chance to work on your visibility and presence by working on your on camera presence. I will guide you on how to create short videos. Throughout the 4 weeks we will spend together, you will create 7 videos. This way you will be able to have "evidence" of your metamorphosis and better understand your self and the way others perceive you. Show Up and Be Seen! We would like to thank our partner in this event, Lloyd Hotel and Cultural Embassy. Nancy Bishop, CSA | American Casting Director: Auditioning for Film and Television Masterclass. 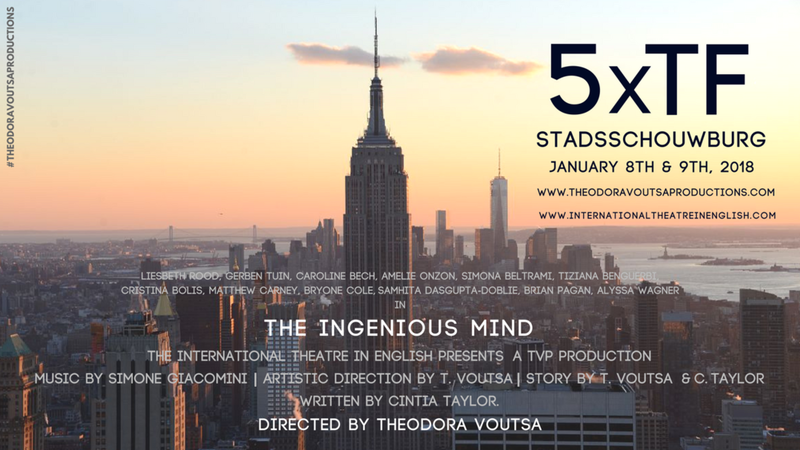 The Masterclass is hosted by the International Theatre in English and Theodora Voutsa Productions. Actors participate in a series of targeted exercises that develop effective methods for on camera work. Material covered will include close-up vs. wide shot techniques, playing an inner monologue and playing objectives. At the end of class, actors will be assigned scenes to prepare for mock castings the next day. WHERE: IJdok 89, 1013 MM Amsterdam. Send your CV at thelosangelesmethod.com to receive further information and secure your spot in the Masterclass. Deposit and tuition non refundable. 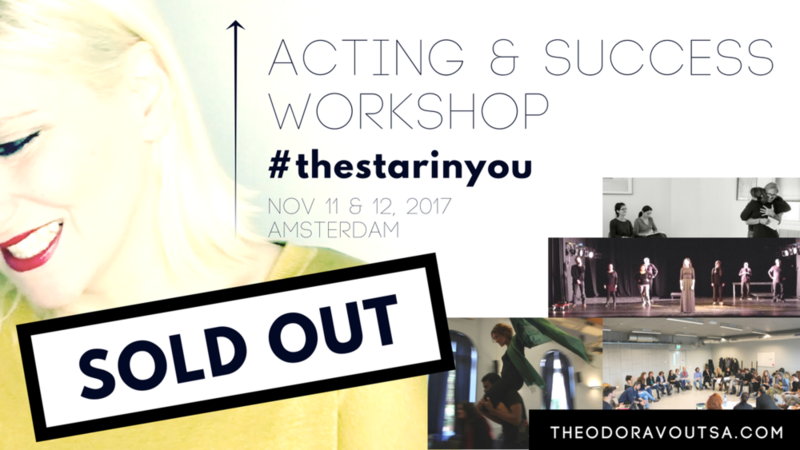 The Masterclass will take place at IJdok 89, 1013 MM Amsterdam. Antigone is the second production by iTie - The International Theatre in English, part of the Stichting TheodoraVoutsaProductions. Performed by a cast of 30 Dutch and international Artists, it is a multidisciplinary production that pays homage to all the women who once dared to be a girl. Caroline Bech, Lolu Ajayi, Simona Beltrami, Chandler Bullock, Blanche Belamide, Christine Blaneley, Francis Cox, Hale Ceylan, Anna Divani, Laurens De Groot, Imra Dincer, Muge Ergecen, Vasiliki Koutrouli, Murat Gur, Serkan Kaba, Ken Kitchen, Lisa Luca, Bianca Lanterdoff, Elisha Moore, Amelie Onzon, Brian Pagan, Perikles Panagouleas, Leon Van Waas, Eleftheria Vakaki, Mike Wijdenbosch. Completing the quest for meaningful content that solves, saves and sells. Timi has worked with the following brands in varying capacities: Unilever Food Solutions/Emakina, Sony Europe, LinkedIn, iris (Heineken), Call for Action, Droog Design, Casengo, Madaga, Federation of Financial Planners, Chrysal, Nomads / Delete Blood Cancer, De Lage Landen, The Osqr Group, Vector Fabrics. She is a Content & Social Strategist, Writer, Owner: Social Sense Consultancy. She is working as a Multi-Country Organisation Manager & Content Strategist: Emakina NL Co-founder, Digital Strategist: Kultura Co, an initiative to help Filipino cultural entrepreneurs offer more innovative products and services, access new markets and expand their networks Secretariat: Leadership and Social Entrepreneurship Training Program for Migrant Filipinos in the Netherlands; Co-founder, Digital & Content Strategist: Red Vinta (Dubai), a creative innovation agency. In this meet up is about the future of content which will always be about things far bigger than content. Content fuels any social media network and lies at the core of any digital transformation strategy. But do you know what’s at the heart of content? Content starts and ends with people; it rises and falls with relationships. Genuine helpfulness has always been the bedrock of great relationships. Without content – without meaningful, helpful, and compelling content – business will lose the ability to connect, engage, and build longer lasting relationships with people. Ask yourself: Are you making content that’s helpful or full of hype? Is your content all about driving the sales pitch instead of helping your audience make better decisions? Does your content solve for humans or for satiating the Content Machine? I help you advance from Content Maker to Content Crusader. I’m one of the many out there plotting the downfall of the Content Machine. I believe I can relieve the frustration of entrepreneurs and business owners like you when it comes to content by helping you rethink why, for whom, and how you are creating and distributing content. I want to enable you to start smaller but with compelling focus; re-energise your efforts by placing people and relationships back at the core of content marketing; and develop content in a way that it helps you validate learnings about your business. I’m passionate about content, because I’m passionate about people. I consider content a tangible instrument to solve problems and elevate people to greater heights. Transmuting your competency and passion into content that solves people's real-world problems is the most honest and lasting strategy for audience-building. My passion for social and content is anchored by my solid experience in teaching, writing, requirements management, and development communications. This enables me to apply an integrated approach to projects and provide holistic solutions. The people I work with always get the total value they deserve. When: November 26th, 2015 | 7pm to 9pm Presentation, 9pm to 10:30pm Networking and drinks. For members: 20 euros | includes first drink.